Newly elected DNC chairman Tom Perez started off his term with a show of party unity by appointing Keith Ellison as DNC deputy chair. In the interest of full disclosure I supported Ellison but am now fully behind Perez because party unity is the ONLY way forward. Congratulations to both men and I believe that both will be successful in leading the Democratic Party back to prominence. 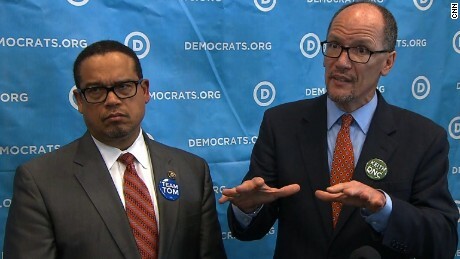 Tom Perez used his first motion as chairman of the Democratic National Committee (DNC) on Saturday to appoint his top rival for the position, Rep. Keith Ellison (D-Minn.), as deputy chair of the DNC. "I would like to begin by making a motion, it is a motion that I have discussed with a good friend, and his name is Keith Ellison," Perez said during his acceptance speech, announcing the appointment. "Did I hear a second?" asked Perez, the former Labor secretary during the Obama administration. "Second!" the DNC audience shouted. Ellison and Perez embraced. When Ellison took to the mic, he congratulated Perez for "successfully passing his first motion" and called on his supporters to back the new DNC chairman. “We don’t have the luxury to walk out of this room divided,” Ellison said during his speech. “If we waste even a moment of going at it over who supported who, we are not going to be standing up for those people."